World time has gotten flatter, faster, and more visual -- compressed onto our flat screen TV's, through our 24/7 cable news access, and on some highly complicated wristwatch dials. We now live in all 24 time zones colorfully, simultaneously and with wrist defining flair. 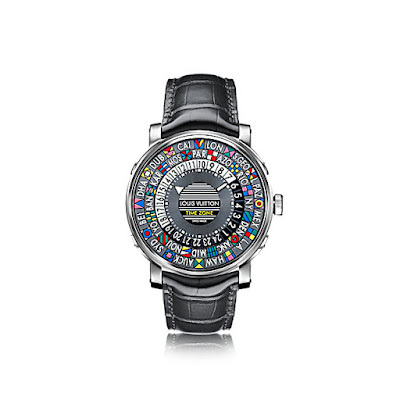 That's what came to mind when I saw the Louis Vuitton advertisement for its Escale Time Zone Watch (Wall Street Journal, March 17, 2016). Escale Time Zone Watch. http://us.louisvuitton.com/eng-us/products/escale-time-zone-010461. But hold on. This post's not about that watch but three of its 60 year old predecessors which were equally impressive in their own time, 1956. 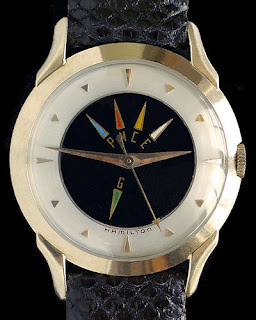 That was the year the Hamilton Watch Company introduced the Cross Country and Trans-Continental models for men; and the Starflite for women. In that year, according to the U.S. Bureau of Transportation Statistics, there were 46,004 "Revenue Passenger Emplanements." In other words, that's the total number of either originating or connecting passengers boarding aircraft in the US. Hamilton had an existing and growing market beyond the railroads. National advertising was all important for this Hamilton innovation. 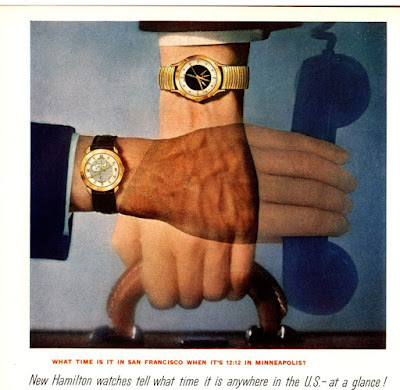 The company featured the Cross Country and the Trans-Continental models in Time Magazine's March 26, 1956 issue emphasizing how wearing time when traveling or even using the telephone can cross time zones, solidify communications, and presumably clench deals. Visual excerpt from Time Magazine advertisement, March 26, 1956,No. 13, p. 49. According to the ad's copy, the watch at top is the Cross Country model. It has a 10K gold case, is shock-resident and comes with a strap. In 1956, it retailed for $69.50 ($611.35 in today's dollars*); and with an expansion band, $75 ($659.73 in today's dollars). The watch on the left in the advertisement is the self-winding Trans-Continental which was also shock-resistant and waterproof. 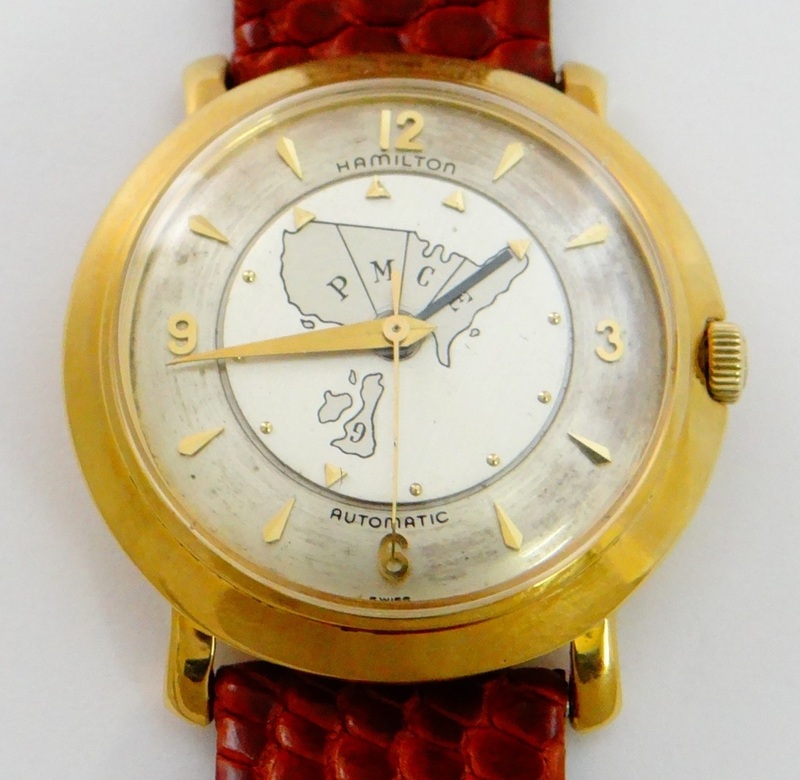 (The self-winding feature was a new Hamilton innovation in '56.) The 10K gold-filled case with strap retailed for $95 ($835.65 in today's dollars); and with an 14K gold case, $185 ($1,627.33) in today's dollars adjusted for inflation). 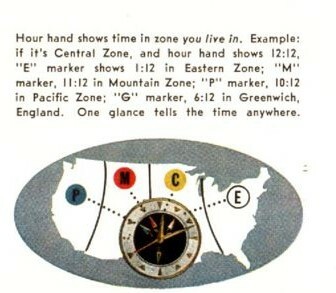 Its dial face had a map of the United States with the time zones marked accordingly. 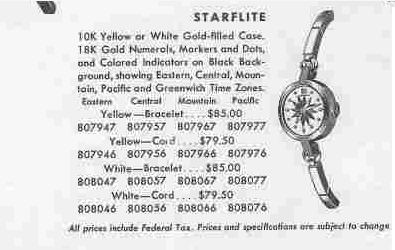 The Ladies' Starflite model was similar to the Cross Country in its dial design and price range, $79.50 to $85 ($699.31 to $747.69 in today's adjusted dollars). Excerpt from Hamilton Watch Company Dealer's Catalog, p. 6 Starflite model. Now It's 2016--Sixty Years On -- And the dual time zone watch construct still offers traveling practicality. I live in two time zones, either living in Spain, but communicating with the Museum here on the East coast, or staying here and communicating with Europe. A GMT or dual time zone watch does that for me instantaneously! On Saturday, I fly to Singapore, prior to landing I will set my watch to Singapore time, and the GMT hand to Eastern Time. I will then, for the first day base my body clock on Eastern Time, helping me avoid jet lag. It works, I know, I have traveled most of my life. * Adjusted dollars are derived from the online US Inflation Calculator.